I’m delighted to be here today with you, the leaders of Jewish communities across North America. You work tirelessly to strengthen Jewish identity and you work tirelessly to support the State of Israel. You are Israel’s partners, you are my partners in building the Jewish future. Now, this past year has not been simple. Great issues were debated. Passions ran high and the stakes were even higher. But we must always remember two simple truths. The first one is that no matter what disagreements there are between Israel and the United States, Israel has no better friend than America and America has no better friend than Israel. Here’s the second truth: No matter what disagreements there have been within the Jewish community, maintaining the unity of our people is of paramount importance. There is only one Jewish people. There is only one Jewish state. And now, more than ever, we must work together to unite the Jewish people and secure the Jewish state. Israel is a state of amazing, amazing successes. If we were in the South, I would say amazing grace. I’m saying it here too – amazing success, amazing grace. You know all about the start-up nation. You know that Israel is a global epicenter of innovation, of ingenuity – a leader in water technology, in agritech, in medicine, in science, in cyber. I want to give you two numbers. First on water: We had twice the rainfall in 1948, the year of Israel’s founding and one-tenth the population. So in 67 years, the water supply has gone down by half from rainfall, roughly half, and the population has grown ten times. Our GDP per capita has grown 40 times, and with it goes water usage. So we had to have a big water problem, but we don’t. We have a water surplus. Israel leads the world by far in the recycling of waste water and in so many other technologies related to water. And people are coming to us and they say: Teach us. Or la’goyim. Teach us. Teach us what you’ve done for yourself. We can do it in Asia, in Africa, in Latin America. Every week somebody else comes and says teach us how to get water out of the stone. So here’s another little factoid. Is that how you call it, factoid? Factum? Fact. Okay, here’s another fact. In 2014 Israel was receiving 10% of the global investment in cyber security. That’s an extraordinary number given that we are… It’s about 100 times our size in the relative population of the world. In 2015 that number has changed. It grew from 10% to 20%. It doubled in one year, one year. So in cyber, Israel is punching 200 times above its weight. That’s an extraordinary figure. In cyber, in water and in many, many other fields of Israeli technology, our economy continues its remarkable ascent. In 1948, Israel had roughly the same GDP per capita as our neighbors. Today Israel’s GDP per capita has surpassed the European average and according to three of the four indices that I looked at before I came here, it surpassed that of Japan. And as our economy has grown, so has the reach of Israeli exports. Today Israel is dramatically increasing trade with India and China. I point that out because they’re two small countries, and together with our small country, we encompass about a third of the population of the world, which is another factoid you can file away. The combination of new innovations, really new products and services, and new markets, is propelling Israel’s economy to ever greater and greater heights. That’s important because, you see, while we have tremendous opportunity, we also have one or two challenges. I think you’ve heard about them. We have to pay for defense. Defense is very, very expensive. In fact, it gets more and more expensive all the time, so the principal way by which we pay for our defenses is by growing our economy. And the other, I have to say, is the generous support that we are getting from the United States of America, and yesterday I had a wonderful discussion with President Obama how to secure that assistance for the coming decade. Thank you America and thank you President Obama. I know that all of you are proud of Israel’s stunning technological achievements. But I think we should no less be proud of Israel’s values. And you see those values on display every day. You see it in our freedom – when you watch the passionate speeches in our Knesset, if you bring noise plugs, and indeed when you read the spirited debate in our press – bring pink sunglasses; it’ll lower the glare. But this is democracy. This is intense, robust democracy. You see it in our pluralism – in our growing and thriving Christian population, the only Christian population in the Middle East that is growing and thriving and not shrinking and being decimated; in our proud and our strong LGBT community. Tel Aviv is a renowned capital of pluralism and diversity and tolerance, as is Israel altogether. You see it in our egalitarianism. You see it in an Arab schoolboy who knows that – or schoolgirl – they can grow up to be Knesset members or ambassadors or a Supreme Court justice. We have an Arab Supreme Court justice, in case you didn’t know. And it’s the only truly independent court in a very, very large radius. You see it in Israeli schoolgirls who know they can become fighter pilots, central bank governors and prime ministers. We’ve had one of each, actually more than one of each – one of each for prime minister. You see our compassion when you visit the hospitals, the field hospital that we’ve set up that treat thousands of wounded Syrians from the battles inside the Syrian inferno. We set up a field hospital I think about ten or fifty yards away, on our side of the Syrian border, and we take in these people who’ve suffered unbelievable tragedy. We take care of them at our expense and we’ve been doing so for years. You won’t read about it, but you should know about it. It’s very important. And you see our values when you follow our expert rescue teams to faraway places like Haiti and Nepal. Just recently we had this horrible earthquake in Nepal and the biggest rescue delegation was from India. That’s a small country. The second largest in the world came from Israel. Second largest rescue delegation in the world. Now, the demonstration of liberal democratic values would be impressive anywhere, anytime. But what is truly remarkable is that Israel upholds these values in the darkest and most oppressive region on earth and when facing unmatched security challenges. This is why when our detractors defame Israel, we must defend Israel. This is why when they tell us that we should be ashamed of Israel, we must tell them we are proud of Israel. From my office in Jerusalem the dangers facing Israel can sometimes appear daunting. Israel is surrounded by many forces driven by fanaticism and hatred. Militant Islam is on the march – the Sunni extremists led by ISIS, the Shiite fanatics led by Iran. But despite these enormous dangers, I have no doubt that Israel will continue to flourish in the years and decades ahead because the people of Israel are strong, because the alliance between America and Israel is strong and because the partnership between Israel and Jewish communities around the world is strong. Through decades of war and terrorism, three generations of Israelis have shown extraordinary fortitude and resilience. I visit our troops just about every week. I go and see our young men and women in uniform and it is an experience that I hope that all of you can share, possibly have shared. To talk with our young men and women in uniform is to be inspired by their deep faith in the justice of Israel’s cause and by their fierce determination to defend our homeland. We’re going to be celebrating Hanukkah. These are the new Maccabees. They have such fortitude, such courage, such spirit. These soldiers are Israel’s future. So believe me when I tell you, Israel’s future is in very, very good hands. The second source of my confidence in Israel’s future is the unshakeable alliance between Israel and America – an alliance that I believe will only get stronger. And as I said, yesterday I had a very good meeting with President Obama at the White House, and I deeply appreciate his commitment to bolster Israel’s security at the time when the Middle East is becoming more dangerous than ever. And I also want to say that we are sharing so many things. The United States is giving indispensable help to Israel, indispensable, but Israel is returning that assistance almost on a daily basis in intelligence and in many other things. I think that what is important is not merely President Obama’s commitment to bolstering Israel’s security for the next ten years, but also his commitment to maintain Israel’s qualitative military edge so that Israel can defend itself by itself against any threat. That is the most important commitment. And despite our disagreement over the nuclear deal with Iran, I believe that America and Israel can and should work together now to ensure Iran complies with the deal, to curb Iran’s regional aggression and to fight Iranian terrorism around the world. Now, the third reason I am confident about the future is the tremendous partnership between us. Since the founding of Israel, well, even before the founding of Israel, you have been our partners in building the Jewish future. Your support has been invaluable in helping Israel successfully absorb millions of immigrants, build world-class hospitals, create an oasis of modernity in the middle of the desert, and in the last two decades, well, in the last two decades, well, Israel has begun investing in you. This was a revolutionary idea that was put to me, a young prime minister, 20 years ago. They said, well, you know, the Diaspora and Jewish communities, especially in North America, have been investing in Israel, you know, for five decades. How about returning the favor? As our economy grows, we could invest in Jewish education, in Jewish identity. And I said, well, that’s a crazy idea. I like that. So well before we reached our current economic levels, we began, and Natan Sharansky remembers that very well, we began to invest in Birthright, which I thought was an extraordinary idea. Now, half a million people later, half a million young Jews, young men and women who have visited Israel, I’m proud to say that we’ll continue to invest in Birthright. It is, after all, our birthright. And tens of thousands of course, tens of thousands have participated in the longer Masa programs. And thousands have decided to make Israel their permanent home. I think the hundreds of thousands have come back to their communities – this is a large number. Hundreds of thousands who come back to the Jewish communities with stronger Jewish identities and a stronger commitment to the Jewish future – that strengthens the Jewish world. It is a remarkable program. And whether Jews decide to live in Israel or not, I want to guarantee one thing to each and every one of you: As Prime Minister of Israel, I will always ensure that all Jews can feel at home in Israel – Reform Jews, Conservative Jews, Orthodox Jews – all Jews. As a testament to my commitment to this principle, I have established a roundtable, headed by my Cabinet Secretary, to address the concerns of the different streams of Judaism in Israel. That’s significant. That’s a governmental decision. You want to know our politics? Not now, but that’s a significant decision. This is a roundtable of the Government of Israel in which the various streams of Judaism sit together side-by-side to discuss problems and more importantly to discuss solutions. And now, for the first time, the Government of Israel is joining with the Jewish Agency to invest in strengthening Reform and Conservative communities within Israel. I am also hopeful that we will soon conclude a long overdue understanding that will ensure that the Kotel is a source of unity for our people, not a point of division. And we’re getting there, I have to say. The unity of the Jewish people is important at all times, but especially at this time. It’s especially important when the assault on the Jews is not confined to the Middle East, because as Michael said correctly there is a wave of anti-Semitism that is raging across Europe, but it goes beyond there to other continents as well. I want to say something about anti-Semitism. My father was a great historian and a student of this phenomenon. It has ancient roots. It goes back roughly to Hellenistic times, five hundred years before the birth of the Christian era. It has a long tradition and old traditions die hard. Sometimes they don’t die. For centuries the world believed the worst things about Jews – and these lies were believed not just by the ignorant masses; they were believed as well by the educated elites. They said about us that we were poisoners of wells, spreaders of plagues, killers of children. Now the lies that were once leveled at the Jewish people are now leveled at the Jewish state. They say that Israel harvests organs, spreads AIDS and executes innocent children. Once, the Jewish people couldn’t even raise its collective voice to fight against these lies, these slanders. Today, we have a voice. Today we have a voice. And we must ensure that our voice is heard loud and clear. We must speak out against the slander of the Jewish people and the Jewish state. Now, whether it’s the Prime Minister of Israel speaking at the United Nations or Jewish students speaking at a college campus, we can and must fight lies and the only way you fight lies is telling the truth. We have nothing to be ashamed of. We have everything to be proud of. Stand up proudly. Speak the truth about Israel. Be proud as Jews. The truth is Israel is a great country, a deeply moral country. Of course, like all countries, Israel is not a perfect country. But Israel is constantly judged by many in the international community according to a standard of perfection that is applied to no other country and that no country could possibly meet. There is a name for holding the Jews to a different standard than other people. You know what it’s called. It begins with an “a” and it ends with an “m”. We recognize it for what it is. You cannot, you cannot hold the Jewish state to what I call the triple standard. One standard is for the dictatorships – you don’t expect much of them. The second standard is for the democracies. And the third standard – it’s not even a double standard, it’s the triple standard. There’s a special defined standard for the democracy called Israel. No way, no double standards, no triple standards. Treat Israel fairly. Treat Israel decently. Now I have a friend whom you may know. His name is Alan Dershowitz. And he gave what I think is a very good test. He said this in the Oxford Student Union. By the way, he said he was the only one who won an Oxford Student Union debate on Israel. He gives a great fight. So here’s what our friend Alan Dershowitz, a great exponent of the truth, said. He said name a single country in the history of the world faced with threats comparable to those faced by Israel that has a better record of human rights, complies more rigorously with the rule of law and does more to minimize civilian casualties. He asked that and the answer was: There is no other country. Israel stands at the top of the list. And I think we have to speak the truth about peace as well. The truth is that the reason that we don’t have peace yet with the Palestinians is not because of the settlements or a territorial dispute, the territories that that were won in our defensive war of 1967. Israelis and Palestinians had a conflict for half a century – almost 50 years – before Israel captured any of those territories or built even a single one of those settlements. And afterwards, we left part of that territory – Gaza. Left it to the very last centimeter or inch. Stripped out the settlements, went to the ’67 boundaries, uprooted all the people who were there, disinterred people from their graves. What did we get? Peace? We got rockets. The truth is that the reason that there isn’t peace between Israelis and Palestinians is the persistent Palestinian refusal to recognize the Jewish state in any boundary. That’s the truth. If you recognize the problem, you’ll be able to get to its solution. And here’s another simple truth: The truth is that Israel seeks peace. The truth is that I seek peace. And when Israel, the people of Israel, the governments of Israel, met Arab leaders who wanted peace equally, like Egypt’s Anwar Sadat and Jordan’s King Hussein, Israel made peace. We could do so when you meet an Arab leader who essentially says we’re burying the past. We’re seizing the future. We have no more demands of the Jewish state. And when Israel will face a Palestinian leadership that seeks peace, that is willing to bury the past, that will make no more demands on the State of Israel – not get a state next to Israel in order to displace Israel, not get a state next to Israel in order to flood the adjoining State of Israel with millions of Palestinian descendants; when we meet a leader who actually is willing to recognize finally the Jewish state, we will have peace and that is the first requirement, the most essential requirement. I remain committed to a vision of two states for two peoples where a demilitarized Palestinian state recognizes the Jewish state, and Israel will continue to work for peace in the hope that what is not achievable today might be achievable tomorrow. If you have any doubts about Israel’s future, I suggest you think about how far Israel has already come. You know, for each of us, especially the older ones, we have a personal perspective that we can… we can assess the future based on the road we’ve travelled so far. I was born a year after the founding of the state, and the change, in my perspective, has been nothing less than stunning. I remember as a child the excitement that gripped my friends and the entire country as we celebrated our first decade of independence, chag asor. It was a decade in which we won our War of Independence and doubled our population. And as Israel turned 20, I celebrated as a young soldier, with my fellow soldiers and with the people of Israel – I’d enlisted shortly after our great victory in the Six Day War and I was still awed that only a year earlier we had liberated and reunited our eternal capital Jerusalem. I remember the feeling, I remember the feeling at the end of the Six Day War. I’d grown up in Jerusalem, and my father’s office – he was the editor-in-chief of the Hebrew Encyclopedia – and his office was right next to the wall separating Jerusalem. And I would go there because the bicycle fixers were there, so I always knew that I couldn’t go that direction because I’d hit the wall and Jordanian snipers. And all of a sudden, there was, at the end of the Six Day Way, there was a breach in the wall and we started flowing, just thousands, tens of thousands flowing through that breach into the Old City to the Kotel. And we went there and just stood next to the Kotel. Nobody said anything. We were just so mesmerized by realizing the dream of ages. That was what I remember from the third decade of Israel’s existence, the beginning of the third decade. And then, at the end of it, when Israel turned 30, we were on the verge of achieving a great historic peace with the largest Arab country, with Egypt. And when I was privileged to preside over Israel’s 50th anniversary celebrations as prime minister, we were already at peace with Jordan and we were busy welcoming home nearly a million immigrants from the former Soviet Union. Now, two decades have passed since that 50th anniversary – nearly two decades since that 50th anniversary celebration, and we have since then liberalized our economy, won eight more Nobel Prizes – that’s a large number – built 21st century roads and rails, discovered gas, transformed Israel into a global technological power and reversed that joke, “How do you make a small fortune in Israel? Start with a big fortune”. Turned it completely on its head. And we are showing the world new ways to travel, new ways to enrich life, new ways to protect health, new ways to grow crops. Today we’re forging new ties with countries in Asia, Africa, Latin America, and no less important, today we’re forging new ties with Arab states in the region that increasingly see Israel not as an implacable enemy but as a valued ally, as a partner, in confronting common dangers together. I hope they also see it as a partner in seizing the future for the betterment of their peoples in this great battle between modernity and medievalism. Modernity must win. So now that Israel is approaching the end of its seventh decade, we can only marvel at what we have been able to achieve against impossible odds. And I have no doubt that despite the enormous challenges we still face, Israel will continue to thrive because I believe in the indomitable spirit of our people, because I believe in our unshakable bond with the United States and because I believe in you, in the unbreakable bond that unites Jews everywhere with the Jewish people. It’s a bond of faith. It’s a bond of hope – not the shallow hope of wishful thinking but the deep wellspring of confidence that comes from a people who have forded history’s most turbulent rivers and emerged triumphant on the other side in the Promised Land. That’s what I believe in. Thank you all for your indispensable part in our common journey. And thank you all for your unceasing efforts to secure our common future. Thank you all. Thank you very much. 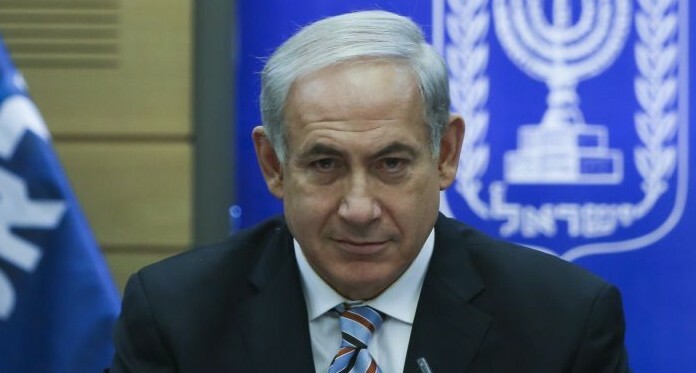 Full text of Prime Minister Benjamin Netanyahu’s Remarks to the Union for Reform Judaism, delivered via satellite from Jerusalem, December 15, 2013.